Occasionally clients ask me to remove the ribbon from their SharePoint environment. Technically speaking, it’s not hard to do – but there are many good reasons to keep the ribbon in place. SharePoint has had a responsive, dynamic ribbon since SharePoint 2010. At the time, I personally wasn’t too sure about this change – but it was already implemented in Office 2010, so I could roll with it. I found that users get used to it very quickly, especially as it provides a consistent way of working across the Office platform. On the rare occasion that I work with SharePoint/MOSS 2007, I’m completely lost without the ribbon. Hiding the ribbon is really quite easy. I can recommend Hide Ribbon on SharePoint 2013 using CSS for SharePoint 2013 as an excellent resource. This article will look at why there are far more reasons to display the ribbon rather than hide it. 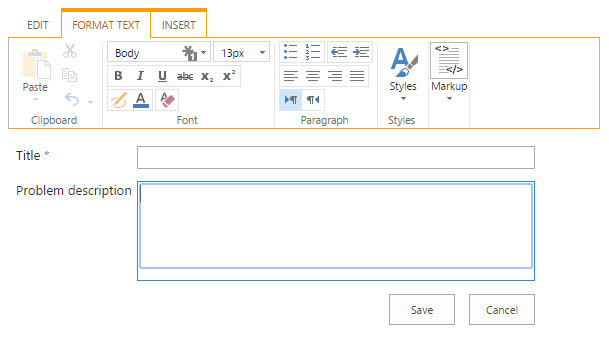 The ribbon is a piece of the SharePoint UI which is visible when working with content on SharePoint. The ribbon falls between the SharePoint top navigation bar and the page content and changes as the user moves through the SharePoint environment. Microsoft introduced the ribbon in Office 2010 and many people hated it. That was 2010 and now some are already running Office 2016. Even Microsoft Visio and Microsoft Project have now been updated to have the ribbon. It is is most definitely here to stay. In fact, I would guess that if someone tried to take it away (or have you run Office 2007), there would be many more unhappy people. People understand that items are grouped under different tabs, that the icons will behave differently as the window becomes larger or smaller and so on. They understand that the little down arrow under “Paste” means that there are multiple options. There was a learning curve for this, but most people have already gone through it. It’s considered normal now. Removing the ribbon in SharePoint takes away a method that people are now very used to using to get their daily work done. #2 – The ribbon changes based on content – don’t assume just because you don’t need it right now that you won’t in the future. The ribbon in SharePoint changes based on what the user is doing at any given moment. While the rest of the Office platform has a fairly static ribbon for each application, SharePoint has so many different functionalities that it makes sense to offer the user only the functionality that they need right at that time. When editing a page of a simple project site, the ribbon updates to show the functionality that is needed. It’s easy to edit the page, edit the properties, view the permissions and so on. The ribbon is again different when in a document library. In this case, a document is not selected and so the specific document functionality is greyed out. This tells the user that they cannot access it right now. If one or more documents were selected, then the appropriate functionalities would be available such as editing the document or viewing the properties. The library tab is still available and tells the user that there are more options there that they might need. As a third example, the ribbon changes again when a user is editing a rich-text field in a form. The different controls for rich text editing become available, such as changing the font, the size, color as well as adding bullets, lists, etc. The insert tab is also available for adding images, links and other functionality. If the user encountered a rich-text field and did not have these options, they could not edit the field properly. The edit tab of the ribbon is available for the save and cancel buttons, mimicking the functionality at the bottom of the form but available in the ribbon as that is a place the user expects to find them. These are only three examples – there are so many more places in SharePoint where the ribbon adds extra functionality for users and places the correct buttons right where they are needed. #3 – There are so many different ways to work; don’t limit your users’ options needlessly. The first two reasons are very practical, but this final reason hearkens more towards usability and personal work styles. Don’t assume that just because you would rather not see something that all of your users would agree with you. Not everyone works in the same way. There are many differences in perspective, ranging from how comfortable people are with different applications to generation differences to personal work-styles. 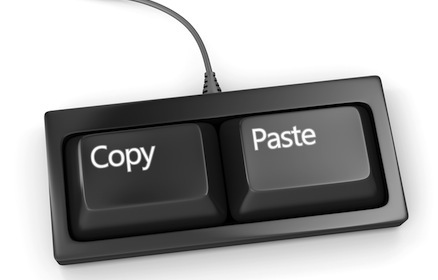 One person may copy and paste using keyboard shortcuts, another may use the edit menu options and still others may use the copy/paste buttons in the ribbon. None of these are wrong – just different approaches based on personal preferences. Give users the chance to try it and find out if it works for them – please don’t just show them a screenshot and ask “do you like this?” but have someone give them a well-balanced demo of how their SharePoint environment would work. As a an experienced SharePoint consultant, I believe that it is generally better to give users the opportunity to learn to use new features and reap the potential benefits of having more tools at their fingertips. Unless a functionality could cause damage, there is no reason to remove functionality. Users are resilient and will learn; you can always support them with training or documentation if need be. The more your users learn, the more capable they will be when working with different systems. It is always possible to remove the ribbon later, if it turns out that it is creating problems for your users. Years of experience says that it generally won’t be a problem, though. If you are considering removing the ribbon in your SharePoint environment, my advice is to give it a try and let people work with it – often times, it will work better than you may expect.